I purchased this X in April of 2017. 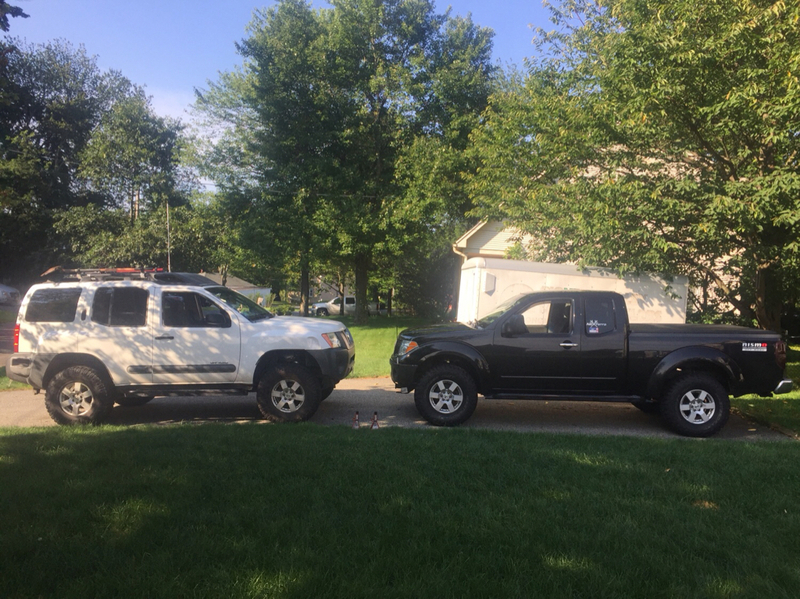 The main reason I bought an Xterra is because many of the modifications I made to my 2007 Frontier would transfer over to the same generation X. The previous owner of this X installed Shrockworks sliders and diff cover, PRG 2 leaf AAL and 2” coilover spacer, Volant intake, Cobra 18 cb with a Lil-Wil magnet mount antenna, and a set of mostly worn 285/75 TA/KO’s. It looks like it was wheeled previously to me. There is a dent over the front passenger wheel, a scrape across and around the gas filler door, and the rear driver plastic corner was crushed and popped back into place. 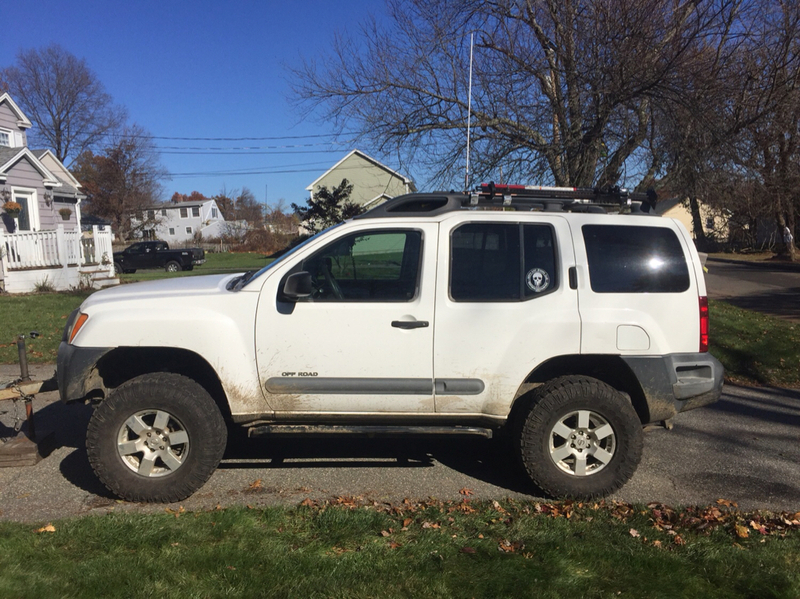 My first few weekends with the X were spent stripping the Frontier of mods and moving them over. The Radflos cam off the Frontier. I replaced them with a set of TJM extended travel coilovers I had previously, and a new set of Bilstein 5125’s. In order to fit the extended Radflo coilovers and 8” travel Radflo shocks on the X, I also needed to add SPC UCA’s, adjustable shackles and extended brake lines. The previous setup of stock height KYB coilovers and the PRG spacer caused obvious coil bucket contact. It must have been happening for a long time, because there was considerable play in the upper ball joint. It was worn to the point of coming loose from the UCA during removal, for the SPC arms. 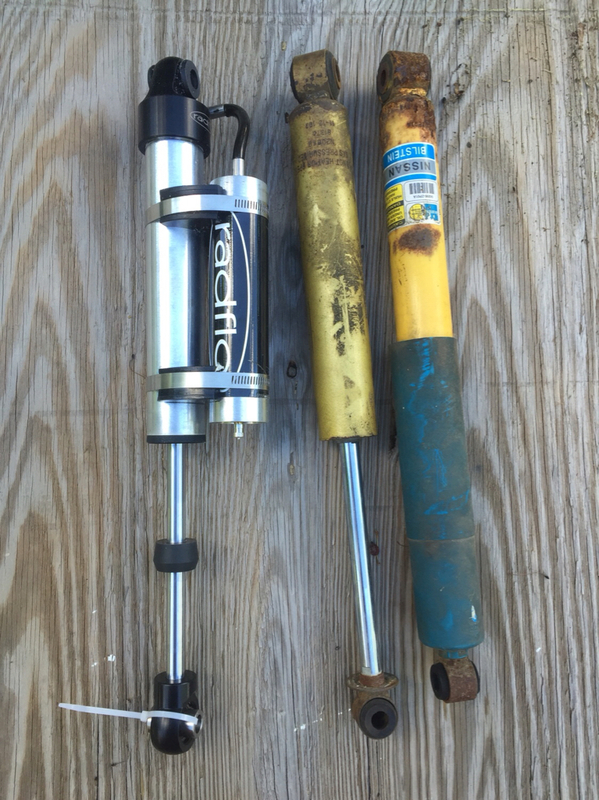 The sagging 2 leaf AAL and shackle set at +1.5” is bare minimum necessary to run these rear Radflos on the X. They were originally ordered for the Frontier, to match its 2” lift. 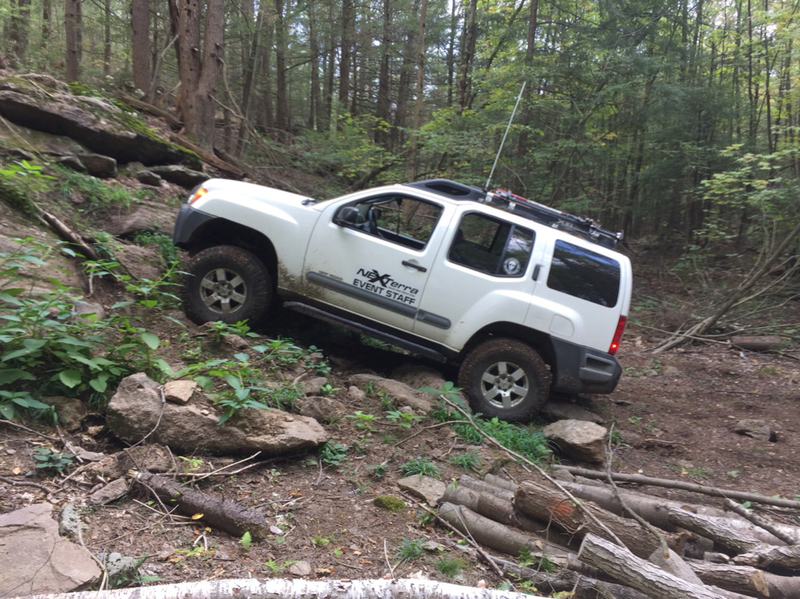 From what I’ve heard, the Frontier’s stock shocks are 2” longer than the Xterra’s stock shocks. This brings me to the conclusion that they are ideal for 4” of rear lift on the X. It’s good to know I have a little more room to lift in the rear, for when it’s time to Titan swap. I moved a diy 1.25” body lift from my Frontier. I already had most of what I needed for the install. 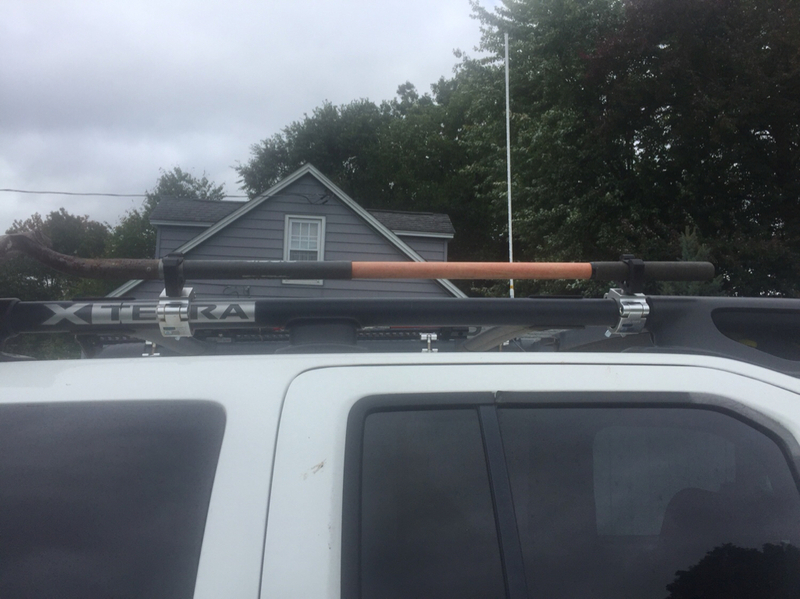 The 6 cab bolts from the Frontier are exactly the same as the 10 for the Xterra. All I needed were the 4 additional body bolts. I chose 1.25” because it was what my math said was bare minimum to fit 35” tires on the Frontier. To this point my choice of body lift height has caused no complications. Although I’ll need to have any bumpers I get modified to match my odd lift size. I was able to move all of my skid plates to the X with little difficulty. They are all exactly the same, except for the t-case skid. 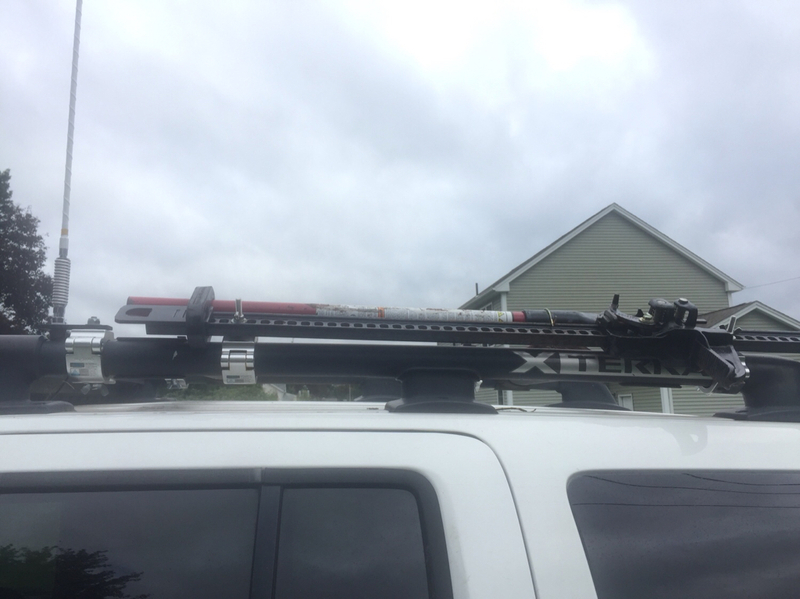 The Frontier’s t-case skid is 8” longer than the X’s. 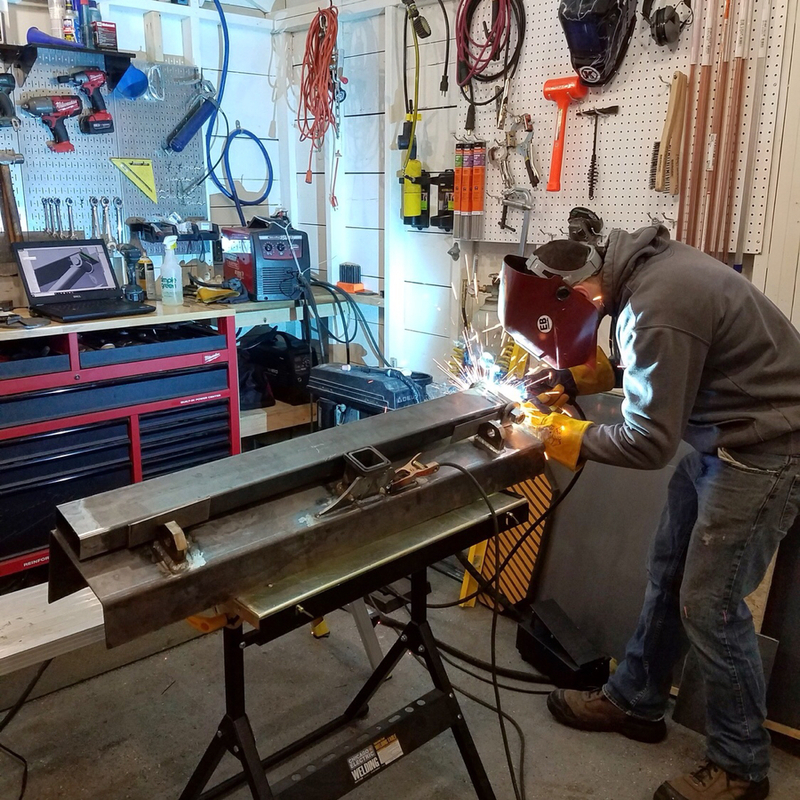 With a 4” grinder and my buddy’s help I was able to modify the skid to fit the Xterra. 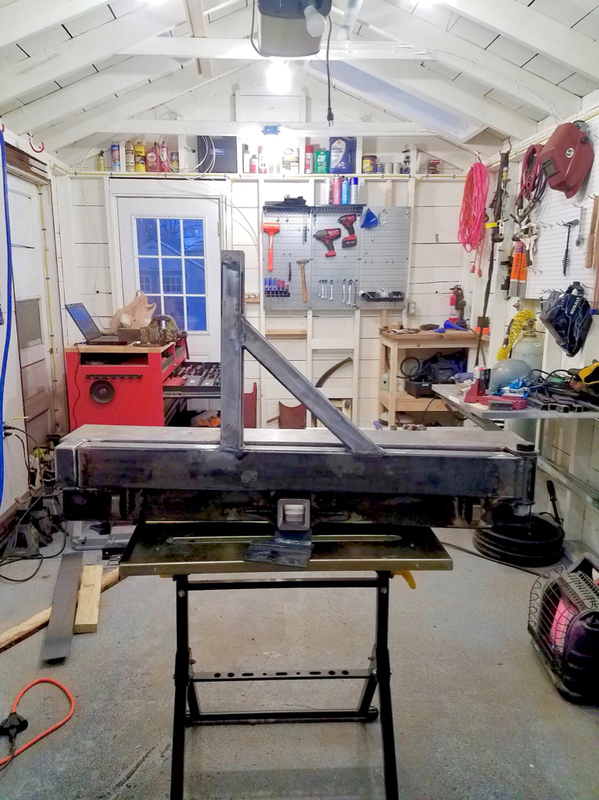 I chose to trim the rear because it seemed easier to triangulate the location of the rear mounting hole than to plot the location of the forward holes. 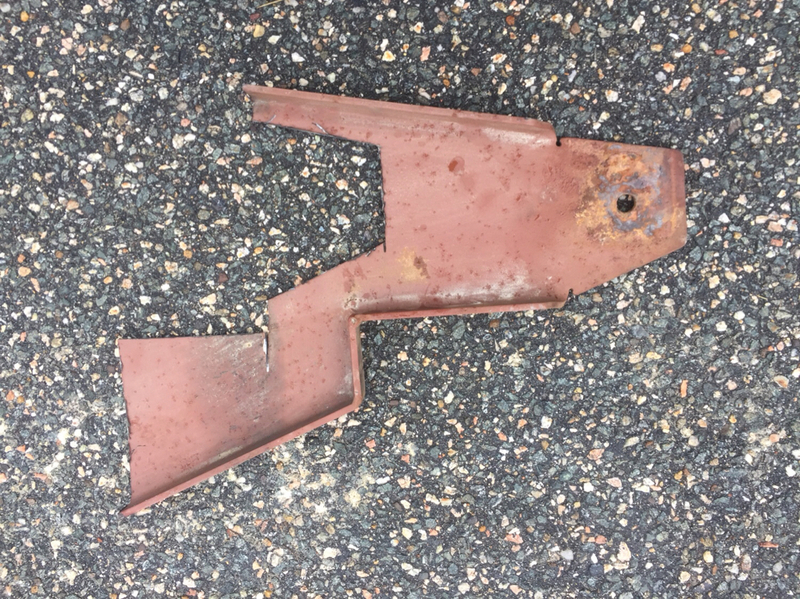 I removed the excess material in the pattern of the tail of the skid, making sure to leave enough metal to bend, to match the existing bends in the skid. 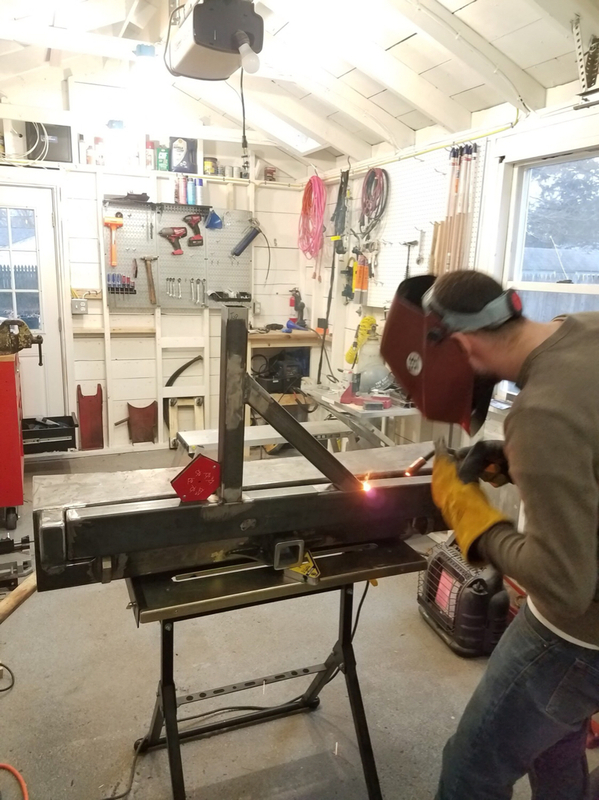 My buddy was nice enough to use his hydraulic press to bend the steel and weld the corners for strength. The cb was mounted in the center console. While this is out of sight it makes it difficult to hear with the console lid closed. I removed it and stuck it between the console and the passenger seat. My original plan was to get an aftermarket single din headunit so I could mount the radio and cb one over another in the stock radio location. This brings me to the stereo. Since the Rockford Fosgate sound system doesn’t play nice with aftermarket components, I’m undecided what to do with it. My options seem to be (1) leave it as it is with no Bluetooth or aux input (2) replace the head unit and speakers at the same time, disregarding the factory amp and subwoofer (3) replace the head unit and purchase the adapter Crutchfield sells to modify the speaker output so it matches the RF line level. To complicate this scenario further, I have a double din head unit from my daughters car that I could put in. I’d rather not buy something I already have, even if it isn’t exactly what I’d like. I’m locked in indecision about the stereo. My next modifications will be to Titan swap the front suspension. I’d like to do it in steps. (1) swap the inner and outer tie rods for Titan parts, install Titan LCA’s, Titan length stainless brake lines, and extended axles for the stock diff. I have stock Titan UCA’s, so I’ll use them until I can afford aftermarket UCA’s. (2) SPC Titan UCA’s, Calmini travel correction brackets, and add the AAL I have to my leaf pack. (3) U-bolt flip, lower shock mount skids, and 2” wheel spacers for the rear. At some point I’ll need a bigger pickup truck. At that time I’d like to take the diffs from the Frontier, since they are 3.69’s. They would be a better match for the 33” tires I have, rather than the 3.36’s. I’d like to add a Lokka or ARB Locker the front at the same time. 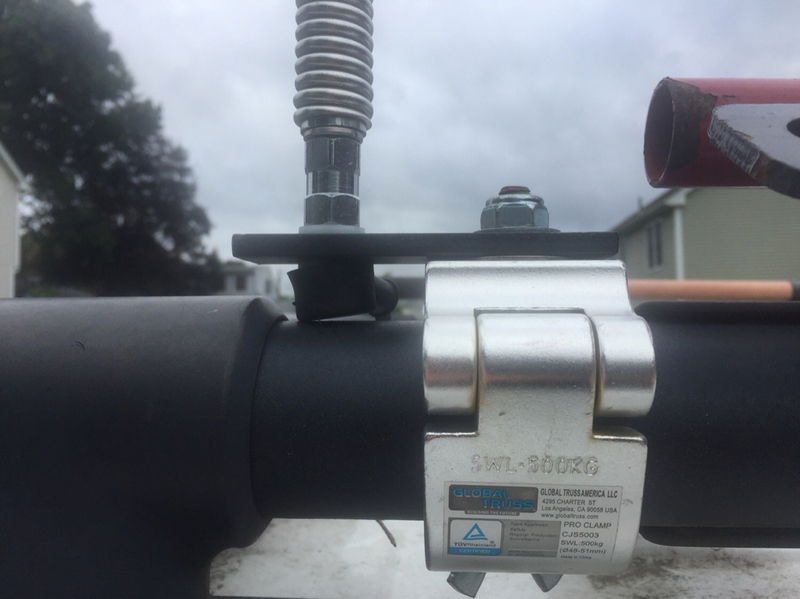 I’d also like to move the Viair compressor, air tank and 1/4” quick connector. Last edited by murphy on Mon Jun 04, 2018 3:55 pm, edited 2 times in total. 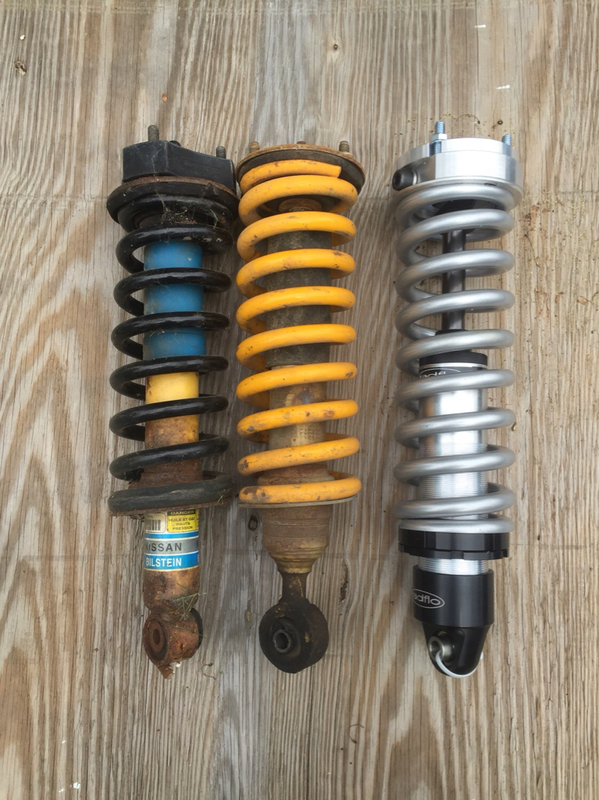 OEM Offroad Bilstein’s with 2” Daystar top plate spacer vs. TJM Extended travel coilover vs. Radflo 2.5. OEM Frontier Nismo shocks vs. TJM Frontier Extended travel shocks vs. 8” travel Radflo 2.0 remote reservoir. What I cut off of the Frontier t-case skid to fit the Xterra. 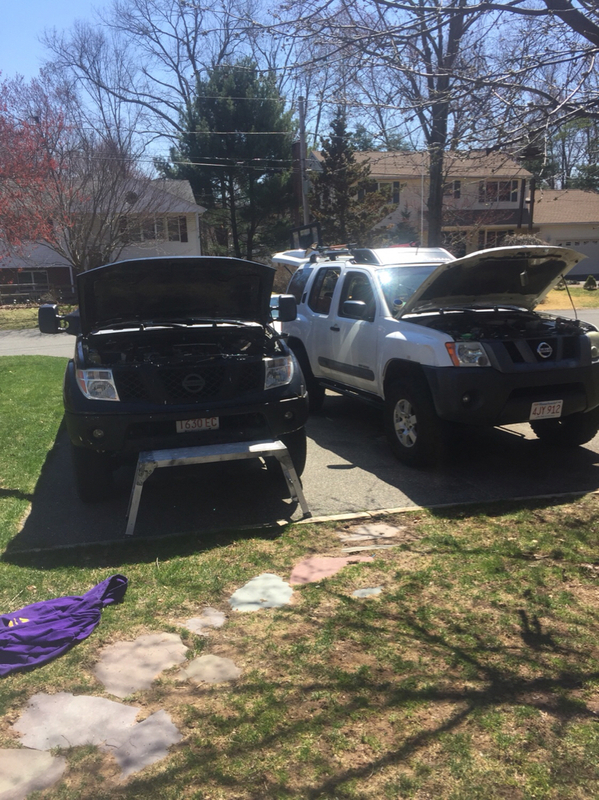 Removing the CXJ intake manifold spacer from the Frontier and installing it in the X. Close up of the 2” D.J. truss clamp I used for my Firestik, hi-lift and shovel mounts. Nice truck, great write up. Thanks. A real build thread has been on my mind for a good time now. A little encouragement from a friend on the forum is all it took to push me over the edge. Read into it what you would like. I don’t see why both couldn’t be true. Nice, John. I'm looking forward to see the progress of this truck. Since the colder weather started the X has been making a whistling/whining noise on the first startup of the day. That along with the water temp being higher than expected, and an oily stain on the fan clutch shaft makes me think the fan clutch is shot. I bought a fan clutch off a member of Clubfrontier. It’s OEM with 60,000 miles. My X has just under 150,000 miles. Should have plenty of life left in it. I went out this afternoon to swap them out. I didn’t get too far. One of the 4 nuts that holds the clutch to the pulley was rounded off. Vicegrips would have been helpful. Mine are at work. I have a small set of needle nose and a medium regular jaw. This seems like a good reason to get a set of small regular jaw visegrips as well. 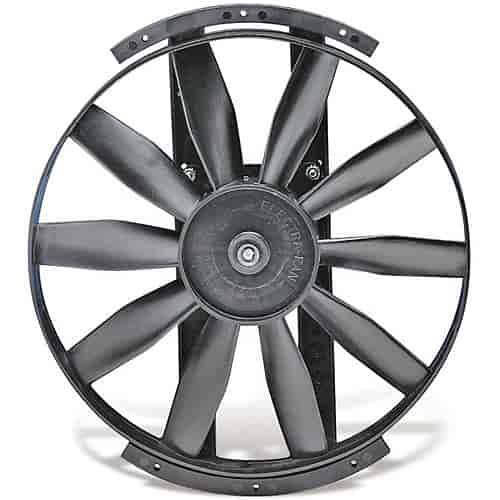 I have a 12” flex-a-lite fan I’d like to piggyback onto the auxiliary e-fan. I’d like them to come on at the same time, and with a switch on the dash. I got a chance to look at the space between the radiator and grill. I was anticipating making it a pusher on the front of the radiator. The driver side has enough surface area for the fan, but the power steering radiator is in the way. I was hoping I could use bushings and longer bolts to space the steering cooler away enough for the fan’s 4” depth. No luck there either. Ther isn’t enough space for both the fan and cooler. I’d need to completely relocate the cooler to make it work. I’ll see if there is enough room to mount it inside the shroud, next to the existing e-fan. This is the fan I have. 12” pusher or puller. I have no sensor or controller, as it is second hand. Not much work being done on the X lately. I have cleared some DTC’s in the last month. P0430and P0420 are Driver/passenger cat below efficiency. This is the first time these have come up. Roughly 2 weeks apart. P0507 is for idle higher than expected. This occurred once early on, in April or May. The spark plugs and sensors before the cats were new in April or May when I bought it. No apparent exhaust leaks. I still need to check the intake for leaks, I heard somewhere that that could cause some issues. I returned the Hypertech program to stock about 2 weeks ago, to see if that was compounding the problem. No further codes yet. But the scanguage says ‘not ready’. On the bright side, working all of these Saturdays has given me the opportunity to save up some cash. Once I sort out these codes, I’ll start ordering some Titan swap parts. Awesome on the Titan swap !! If the cats are shot it’ll put me behind somewhat on the mods. I’ll probably roll 150,000 miles this weekend. They may be due. Both of my cats have been replaced over the last two years. Definitely noticed an improvement in idling after the last one was replaced. I’m hoping the codes were from a bad batch of gas or something similar. If the codes come back I’d like to try some Cataclean or something similar. Not sure if it is snake oil, or if it will make matters worse, but if the cats are on there way out anyway, maybe it’ll buy me some time. On another note, I received some sneak peak photos. I traded Curtis from Dragline a Gibson exhaust for this. I’m excited to get the spare out of the cargo area. When does he expect to have it done.